I went to my parents' house on Friday night and stayed until Saturday afternoon. I ate a lot. And took a lot of pictures. Because going home means FOOD: There's always some leftovers on the counter, or a pot simmering on the stove, or fruit being sliced and served, or someone talking about food, or watching a food show on TV, or cooking or baking or chopping or filling the kitchen with the smells of garlic and something else...something that shouts Filipino and HOME. So several posts to come will be labeled "At home," and I'll share all the glorious (and sometimes weird) foods that can be experienced at my parents' house in just one day. The "sometimes weird" starts now: kare-kare. It's my favorite Filipino dish, and quite possibly my favorite dish ever. 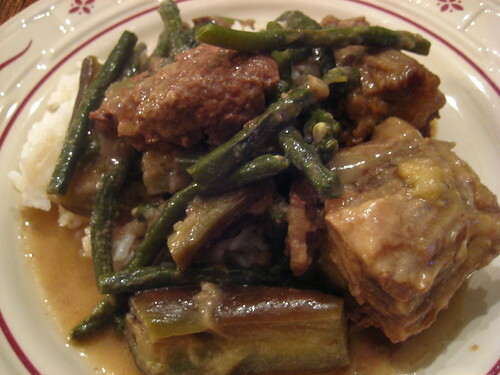 The main ingredients include ox tail, long beans, and eggplant in a peanut butter sauce. YUM. Don't be scared. Ox tail and peanut butter is kind of bizarre, and you might not think the pictures are too appealing. But I grew up with this dish and I LOVE it. Never bothered to learn how to make it because it's really special to me, and cooking it for myself just wouldn't be the same -- it wouldn't be a treat. I'll learn it someday, but for now, I still ask Mom to cook it for me whenever I come home. I requested it for Friday dinner and scarfed down two plates of the stuff as soon as I got there. Kare-kare is best described as a type of stew served over rice, just like most other Filipino dishes. My parents usually eat bagoong on the side, which is a shrimp paste with a salty taste I never even tried to acquire because I always thought it looked pretty weird to begin with (and it's pretty damn salty). Instead, I just mix up all the goodies and shake the salt over my plate. When we were younger, Jenny and I just referred to the dish as "peanut butter stuff." I won't show pictures of us knawing the ox tail bones clean, because that's just gross. But when you're at my house, getting every bit of meat off a bone is expected. We don't kid around: Food means serious business. I just found your site and I love it! Kare-Kare is my all time favorite Filipino dish! I had high hopes that you would have a recipe but I understand why you don't. I always request my mom to make it as well! I'm going to try your pancit recipe soon! Thanks for creating this blog! aj - thanks for stopping by, and so glad you did! sorry about the lack of recipe, but i'm working on learning how to cook more filipino foods, and as soon as i get kare-kare down, i will be sure to share.